Below are some of the most frequently asked questions received from readers. If your question isn’t answered here, please contact the author. Q: My daughter has not yet been diagnosed, but she seems to show many of the signs of NLD. What should I do? A: Given the fact that there are many diagnoses that are widely recognized colloquially, but are not in the DSM, you will need to decide whether the best course of action is to “shop around” for a DSM-recognized diagnosis, which would make obtaining services simpler, or a “correct” diagnoses, say, of NLD, which will help you understand her, but which might impede her school success, since it isn’t an “official” diagnosis. Either way, you want a diagnosis that will help you understand her symptoms, and what challenges she has that will need to be addressed. The best thing you can do for your daughter, besides offering love, support, and understanding, is to do everything in your power to help her avoid being encumbered by the “Special Ed Mindset.” It’s important for you to know this as you search for the right diagnostician. Q: I don’t get it: is NLD real or not? Maybe it’s “real” but is it a valid diagnosis? A: 50+ years’ worth of research, and plenty of people living with it, telling me and each other their stories, only can mean that NLD is very real. The problem is, we won’t know exactly how many people have NLD until it is included in the American Psychiatric Association’s Diagnostic and Statistical Manual of Mental Disorders (DSM). To tell the APA why and how NLD should be included in the next edition of the DSM, or to give feedback on the DSM-5, visit their website. Q: Our 14-year-old son has both NLD and another diagnosis (e.g. ADHD, Bi-Polar Disorder, Depression, Anxiety), and has been prescribed medication X, but it doesn’t seem to help. What do you recommend? A: Since I’m not a doctor, I cannot give professional medical advice. There is no medication for NLD (which perhaps is one of the reasons that it’s not in the DSM – see above), and any medication for a co-diagnosis is a decision best left to your doctor, your son, and you. That being the case, ever since the late NLD author Sue Thompson first suggested that this might be the case back in 2002, there have been many studies showing that giving NLDers ADHD medications (and later, medications for other disorders) has proven to be either ineffective or flat out harmful. As for depression and anxiety, one thing I always say is, “If all else fails, go with the obvious.” So here it is: give your son lots of hugs and kisses, as many as a teenager will tolerate, even more than you think he needs. Beyond the more apparent reason of letting him you are always there for him, the scientific explanation is that skin-to-skin contact increases the production of the neurotransmitter oxytocin, which is responsible for compassion, empathy, and optimism, among others. While this may not alleviate his symptoms, it certainly can’t hurt. Q: My daughter has a diagnosis of NLD and I’m having trouble getting her accommodations in school. I tried calling different state offices and departments, and no one even seems to know what NLD is. What’s that about? 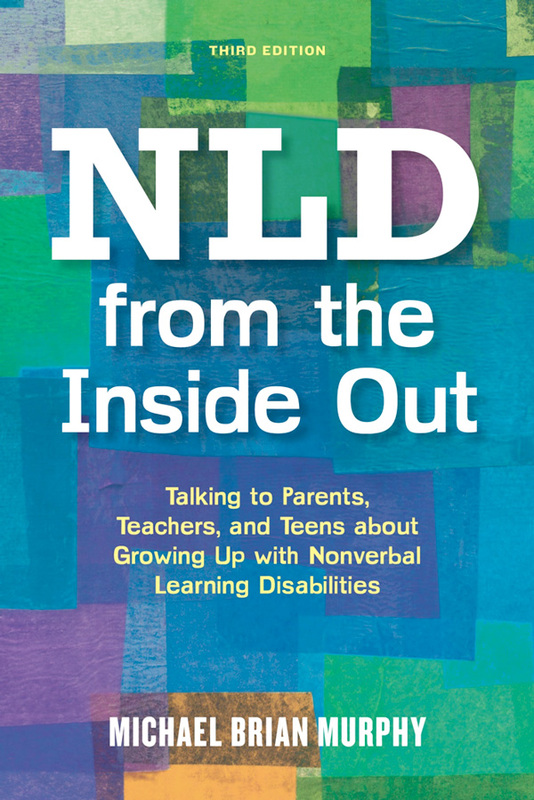 A: The reason there is no coding for NLD is because it is not listed in the current edition of the Individuals with Disabilities Educational Act (IDEA). As such, once a child is enrolled in Special Education, it may be very hard to get an Individualized Education Plan (IEP), which is dependent on the disability definitions found in the IDEA. However, if denied a regular IEP, your daughter still can get a 504 plan. But that doesn’t make it easier for those of us with an NLD diagnosis. As each state’s SPED laws are different, I cannot offer you more specific advice, other than to suggest that maybe you can get accommodations based on your daughter’s individual symptoms, rather than on the diagnosis as a whole. I also suggest an excellent book by Judy Canty Graves and Carson Graves, called Parents Have the Power to Make Special Education Work, which will provide more information. Q: I represent a PTO/library/small nonprofit organization in (NAME OF CITY OR TOWN). Can you please come and speak to our group? What are your fees? A: While I am honored by your request, unfortunately, due to the limitations of my disabilities, I cannot travel, but I am available for Skype or a call in. Please contact me for more information. Q: We are a nonprofit advocacy group/school/library and we’d love to have a free copy of your book to share with our members/clients. Can you please send us one? A: Sorry, I am unable to offer free copies; even I don’t get free copies. You are most welcome to purchase one, whether individually, or in bulk, at the following site: http://www.jkp.com/uk/nld-from-the-inside-out-34160.html, at your local bookstore, or at online booksellers. Q: I’m looking for a good college with an appropriate support system for my NLD teen. What would you suggest? A: Unfortunately, there is no “one-size-fits-all” method to review all colleges and universities for their SPED support. That being the case, virtually every college has at least some sort of “resource room” or “disability services office” where SPED students go to get help and support, or vet their accommodation request letters. But the main difference between high school and college is that in college, it is up to your son to advocate for himself, not up to you or the professors. Hence, all of the worksheets, charts, and sample letter explaining NLD that I included in my book, which I hope you both will find useful. Q: How can I find a therapist who understands NLD? A: Like other kinds of referrals, the most effective way to find a good therapist is to ask other people with NLD who have had a good experience in therapy and who are satisfied with their therapist. If you don’t know anyone to ask, you can try getting a referral from your family doctor, if he or she is sufficiently familiar with you and the issues raised by having NLD. For most of us who have health insurance, the choice of therapist will be informed by which therapists are included in the insurance company’s network (otherwise, the insurance company will not pay for therapy). Most insurance companies will provide a list of therapists, sorted by location and specialty. Usually, if you see among the specialties “ADHD,” “learning disabilities,” or “autism,” these therapists may be more likely to have an understanding of NLD. But the best bet is to call and ask. Even then, as you’ve just read, there are many therapists who just are not effective for us and/or who do not understand NLD at all. The right therapist at the right time can make a lot of difference for your well-being. If therapy is for you, take time to get a good match. You may have to visit two or more therapists before you find one with whom you feel comfortable. Q: I’m a 15-year-old girl with NLD trying to find online forums, groups, or in-person meetups for others with NLD. What do you recommend? A: A lot of the old chat rooms and forums from the late ’90s (NLD on the Web, NLD In Common, nlda.org, etc.) are now either inactive or defunct. Many of the older blogs (Weird Not Stupid, One Foot On The Spectrum, Odd Girl In, Socially Unaware, The Odd Bird, and many more) are still online, but not very active. Now it seems that all the “big names” in the NLD field are on a Facebook group, plainly titled NLD – Non-verbal Learning Disorder. Q: I live in (NAME OF CITY). How do I find a lawyer/LD advocate/summer camp/counselor/occupational therapist/physical therapist, school, etc. in my area that can help my NLD child? Q: I’m about to graduate from college and this scares me. What if I think my NLD is preventing me from getting hired? A: Unfortunately, you are not going to be granted accommodations in the workplace the way you were in college. Whereas schools are required to provide accommodations to students with disabilities under the IDEA (even if the rules for grade school and college operate differently), businesses – large and small – simply are required to not discriminate against people with disabilities, per the Americans with Disabilities Act. This means that, if you feel you were unfairly fired, harassed, or prevented from being hired in the first place simply because you have a disability (i.e. NLD), (as opposed to actually being “unfit for the job,” or “unqualified,” or “not the best match,” etc. ), then you can bring your case before the Equal Employment Opportunity Council. Q: I am high school/college/graduate student writing a research paper on NLD. Can you help me? A: I’m pleased to help young people who are doing research on NLD. Is there something specific you would like to know that is not included in the book? If so, please email me, and I will do my best to answer you, given my own time constraints.